A computer-generated image showing the possible paths of asteroid 2007 WD5. 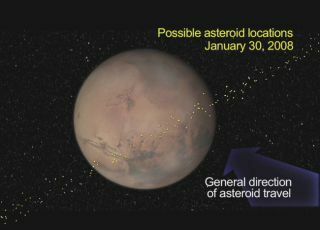 On January 30, 2008, the asteroid may pass through any point seen in the dotted area. An asteroid once thought tobe on a collision course with Mars passed the Red Planet today withoutincident. Astronomers first estimatedthat asteroid 2007 WD5 had as high as a 3.6 percent chance of striking theplanet. Newer observations kept lowering the odds for the 164-foot space rockuntil Jan. 9, when NASA's Near-Earth Object (NEO) program office effectively ruledout chances of an impact. "Mars sees these kindsof near-miss encounters every ten or twenty years, but the impact rate forasteroids this size is about once in a thousand years," said Steve Chesley,an astronomer at the Jet Propulsion Lab in Pasadena, California. Astronomers had hoped thefleet of spacecraft orbiting Mars would get a chance to observe the asteroidplowing into the Martian surface. The subsequent crater would have roughlyequaled the size of the Meteor Crater that formed in northern Arizona50,000 years ago, with a 0.5-mile diameter. Such an impact would have alsoallowed scientists to study the dust cloud from the impact. "We were hoping for aspectacular show to reveal a lot," Chesley said. "We've actuallynever seen a significant impact on a terrestrial planet." Mars is a smaller and hardertarget for space rocks to hit when compared with Earth, but about five times asmany asteroids cross the Martian orbit, according to Chesley. 2007 WD5's patharound the sun ranges from just outside Earth's orbit to the outer edge of theasteroid belt between Mars and Jupiter, but will not impact with either Mars orEarth in the next century, JPL researchers said. The asteroid missed Mars bya distance of approximately 6.5 Mars radii. Similar near misses occur withEarth. And similarly, astronomers sometimes give odds on a possible impact andthen, with further observations, reduce the odds to zero. In fact, the Mars flybyoccurred a day after a 500-footasteroid flew by Earth at a distance somewhat greater than from the Earthto the Moon. Chesley and otherastronomers considered having one of the Martian rovers eyeball the passing2007 WD5, but judged the task too difficult for the robotic explorers. None ofthe orbiting spacecraft turned their cameras or other equipment on the passingrock, either. "After we knew it wasgoing to miss, it's really a pretty ordinary asteroid cruising around the solarsystem," Chesley said.